The Atlas of the Earth's Magnetic Field (AEMF) represents a unified set of physical, geographic, thematic, and historical materials for a detailed study of the geomagnetic field from 1500 to 2010. The AEMF is intended for a wide range of scientists, teachers, students and experts in applied areas relating to the geosciences, including geologists and geophysicists studying geomagnetism. It is a unique cartographic product that contains comprehensive and scientifically grounded characteristics of geomagnetic phenomenon, and the results of historical and modern studies of the Earth’s magnetic field. Global modeling of the Earth's magnetic field is one of the principal domains of geophysical research. Indeed, the geopotential field, along with data obtained from analysis of seismic waves, provides the most comprehensive source of information about the structure and composition of our planet, as well as the evolutionary processes that go on. Spatial and temporal models of the magnetic field provide additional information that is indispensable for navigation, geodesy, and the study of ocean circulation and sea level variation. The authors of this project developed a new technology for digital mapping of the Geomagnetic Field (GMF). A resulting series of digital charts of the GMF were developed, including peculiar characteristics of the mapped phenomenon. Among them are the charts of the Main Geomagnetic Field (MGMF), GMF anomalies, spatial characteristics, cyclic variation, and other features. Thematic digital charts of the MGMF components relate to different geomagnetic epochs according to results of historical and instrumental observations. They provide an effective way of presenting and exploring the MGMF and its evolution over time. The charts can be issued as individual cartographic works, and in the form of special collections. An example of the latter is the present Atlas of the Earth's Magnetic Field. The authors applied professional tools for creating the GMF digital charts, including ArcGIS for creating maps in raster and vector formats. With the help of this software, digital charts of the MGMF components, secular variations of the MGMF, isolines, and the non-dipole component of the MGMF were transformed into separate raster images. State borders as of 2010 are represented in the charts given in Sections 1.1-1.4. This Atlas also contains historical charts beginning with the world map of 1603, which includes the geomagnetic equator, shown for the first time by Guillaume Le Nautonier. It continues through the series of charts constructed by F. A. Garnier in 1862 that demonstrate historical and scientific points of view in contrast with those seen in modern charts. 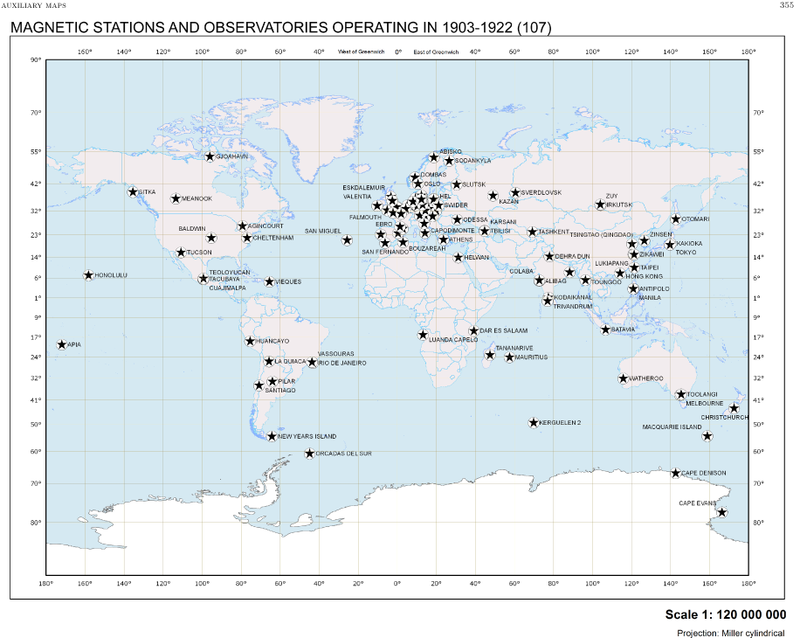 To understand the history and the process of collection of geomagnetic data, we have included additional maps in this Atlas, showing the growth dynamics of terrestrial observation networks since 1813. This Atlas demonstrates the breadth of scientific achievements in the field of geomagnetism. The authors: A. Soloviev, A. Khokhlov, E. Jalkovsky, A. Berezko,A. Lebedev, E. Kharin, I. Shestopalov, M. Nisilevich,V. Nechitailenko, A. Rybkina, O. Pyatygina, A. Shibaeva, Geophysical Center of the Russian Academy of Sciences. V. Kuznetsov, T. Bondar, N. Pushkov Institute of Terrestrial Magnetism, Ionosphere and Radio Wave Propagation, Russian Academy of Sciences. M. Mandea, Centre National d'Etudes Spatiales, France. J. Mabie, US NOAA National Geophysical Data Center.